Lydia Cowles' new South Hill bakery offers the typical lineup of baked goods, but her specialty is fresh-baked coffeecake. When Lydia Cowles finished her four-year stint in the Navy, she didn't know exactly what she wanted to do, but one thing was clear. "When I was getting out," she says, "I was like, 'I don't want to work for anyone anymore.' That's when I started playing around with scratch baking, and I really got into it." The exacting process of creating the perfect cupcake or loaf of bread appealed to her, and when she finished the baking program at Spokane Community College, she started imagining what would become Twenty-Seventh Heaven, her all-scratch bake shop on the South Hill that just wrapped up its 10th week of business. "I knew I wanted to do coffeecake," Cowles says. 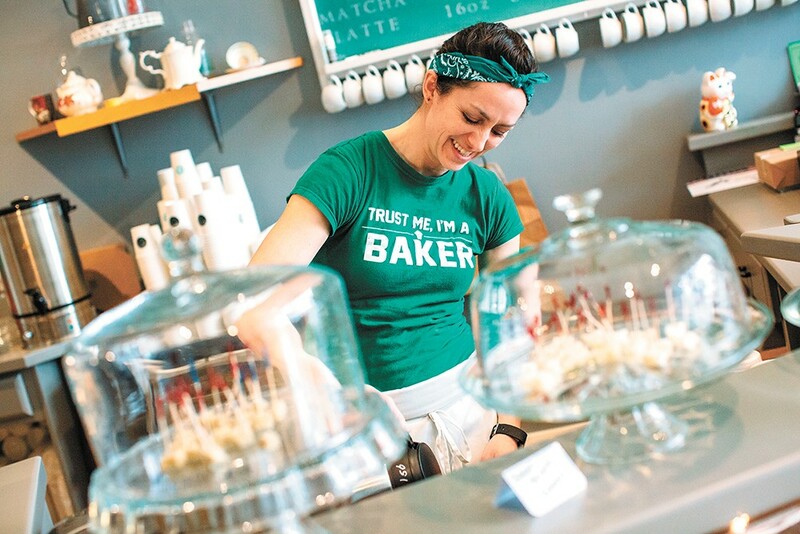 "I knew I wanted to do bread and cupcakes, because people love cupcakes, and you can't really get cupcakes and fresh bread at the same spot." She first spied the space on Grand Boulevard a year ago, and was thrilled that it was still available when she signed the lease in November. While it had counters ready to hold her goods, it was basically a blank slate — one she filled with hanging windowpanes and an old chalkboard after painting the walls a soothing gray. While it's small, there's enough seating for customers to pop in and sip some coffee and enjoy a grilled cheese ($5) or a sweet treat. Cupcakes are available in two sizes, regular and mini ($1.75/$3.50), and come in traditional flavors like chocolate and vanilla, as well as raspberry-lemon, peanut butter and green tea — all topped with a delicious buttercream frosting. More of Cowles' creativity comes through in her breads ($7 loaf/$3 for a miniature loaf). She calls the oatmeal honey her version of a "standard bread," and she does a cinnamon swirl on weekends, but you'll want to check out her garlic pesto loaf: The flavor is subtle, and the pesto is housemade, with sunflower seeds replacing pine nuts. She also has what she calls a "baked potato" bread full of chives, onion, sour cream, butter and shredded potato. "Everything I do is from scratch," Cowles says. "Even my hot cocoa mix, I made it. Nothing comes from a box, nothing is premixed." While you can surely visit other local scratch bakeries, you won't find one as dedicated to the craft of making a quality coffeecake. It's a baked good that Cowles loves, and one she hasn't been able to find consistently. At $3.50 a slice, or $24.50 for a whole, the coffeecake, she admits, "is my hook." "You can't get coffeecake anywhere!" she says. "You can get it at Starbucks, but it's been frozen, and it's not really that great. I can't even think of any other place you can get coffeecake ... People love coffeecake. I've never met anyone who doesn't like it." While opening during Spokane's harshest winter in years was rough, and getting up at 2:30 am to start workdays that don't end until late afternoon (at best) is hard, too, Cowles is happy to have Twenty-Seventh Heaven open in time for spring.